Knowing full well that rhubarbs are technically vegetables Frank very cunningly added blackberries to the mix so that kids would eat his muffin. And contrary to the name rhu-barb does not mean that you will rue anything or be stung by it. Unless like most people you’ll regret not eating more and be stung by the acute feeling you’ve missed out on the most delicious combination of plant matter in a muffin you’ve ever heard of. 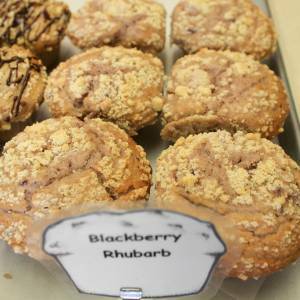 In that case you will rue the day you passed up the blackberry rhubarb muffin. Rue it!